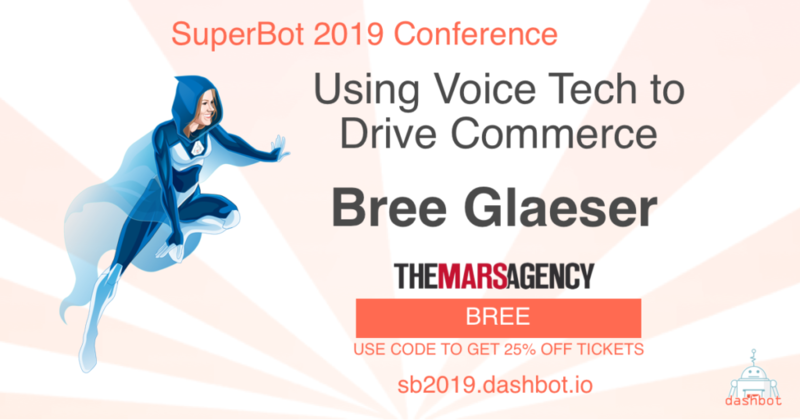 At SuperBot 2019, innovation expert Bree Glaeser will share The Mars Agency’s development of Smart Aisle voice-powered shopping assistance and how it’s poised to change shopper behaviors and purchase decisions. Bree Glaeser is a creative strategist with a strong point of view on designing for voice experiences (VUI). She leads the emerging voice practice at The Mars Agency, a global marketing agency specializing in marketing to shoppers, and was a core member of the team responsible for dreaming up and bringing to life the first-of-its-kind voice assistant at brick and mortar retail, SmartAisle (TM). Bree got into the voice and conversational commerce space via a background in design thinking and innovation. She has acted as a coach/industry expert supporting the Berkeley Entrepreneurship Program, Tech in the Tenderloin, and other innovation groups in the Bay Area, to help students and professionals identify insights and ideate consumer/user-driven solutions. Prior to The Mars Agency, Bree worked on a variety of projects for major brands like Unilever, Danone, and Mondalez, as a freelance marketing strategist. She also has five years of academic research experience as a research assistant for Harvard Medical School and The New School for Social Research. She holds a Master’s degree in Strategic Design and Management from Parsons School of Design and a bachelor’s in Clinical Psychology from Westminster College.